Have you ever heard of the saying that you should start with the end in mind? Well, you should always start with the end in mind. This list are things that stopped current podcasters from reaching their maximum potential. And, hindsight is always 20-20. So, you should stand on the shoulders of giants and learn from their mistakes. For some reason there is a tendency to go out and buy a microphone first. In our heads there seems to be some correlation between a ‘great-perceived’ microphone and a great show. I suppose that is how Nike Air made its billions. We thought we could fly like Michael Jordan when we wore the shoe. Sadly, if you are serious about creating a podcast of value, you should worry about your equipment a bit later on in the equation. Do not go spending your money on something that might not serve you best. In my time as a podcast host, nothing grinds my gears more than those telemarketing microphones. They seem to look all fancy and professional but they are far from it. I think it is the pictures of professional advertising that show us someone wearing one of them next to a fax machine. They are the worst and if you have them, you should have a ceremony and give your dog to play with them. For recording, these headsets are noisy. And because of where the microphone is placed, you will be constantly breathing into the mic. They also make lots of noise whenever you adjust them and when they brush against your cheek. Avoid these at all costs, or you will sound like Darth Vader in your podcast. Also, lapel microphones and USB microphones do not serve the purpose if you are looking for a podcast with good quality audio. In every single conversation I have had about podcasting, I mention at least once how important clarifying your concept is to the success of your show. In fact, I can safely say that it is the most important factor of the equation. If you can’t find the time to clarify your concept, you will be swimming upstream or the remainder of your podcasting journey. Make sure you understand who you are creating the podcast for, how the podcast will fit into your business, and what promises you are going to make your audience when they listen to you. Pat Flynn often mentions that if had to start his podcast over, the one thing he would do is have an email capture on his website. Actually, Tim Ferriss says the same thing. And despite all that, I started my podcast without an email capture. Always, direct your listeners to a massive piece of value that will allow you to communicate with them via email. This is part of the engagement process, you want them to communicate back to you. You want to ask them valuable questions that only they can answer, and you want to sell them stuff which makes their lives better and easier. Sometimes we get impatient. We give gifts to our loved ones before we are supposed to. It is because we can’t sit with the excitement. When that translates to podcasting, we get itchy and release one episode. Make sure you have at least a month’s worth of podcast episodes before you go live. If for nothing else, at least if someone likes what they hear, they have more content to listen to. Release with at least 3 to 5 episodes at one go. 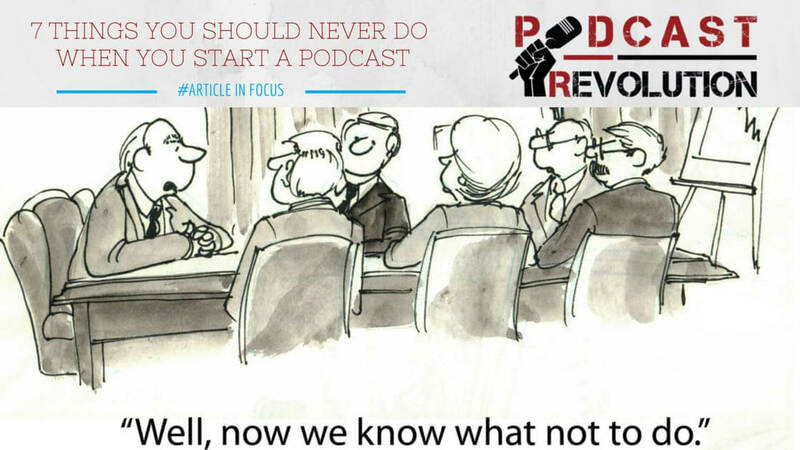 In the world of entrepreneurship we often hear, “prolific is better than perfect.” While this is true in most instances, I guarantee it isn’t true for clarifying your concept and when you tell iTunes you have a podcast. Because when you tell iTunes you have a podcast, they evaluate whether you are worthy of being placed into the New and Noteworthy (N&N) sections. And, you want to be placed in the N&N section. It will be the best launch you could give your podcast. I really don’t know how to answer someone when they come to me for advice on their podcast with the statement, “I am creating a new podcast. It will be 15 minutes long and go out once a month.” For all you readers, please go back and clarify your concept. Find out why you are making important decisions like how often you will release an episode, and how long will each one be. Once you figure out who will be listening to your show and what you are going to provide them, you can make the decision on duration and frequency. What are the other things you think one shouldn’t do before starting a podcast? The tips you gave here made perfect sense. It’s all about progress than too much perfection. Worrying too much about mics and other nitty-gritty stuff is what that sets most of the aspiring podcasters back. These Tips are very helpful, i was thinking of starting a podcast and am glad i came across this article, knowing my audience is key.Thank you!